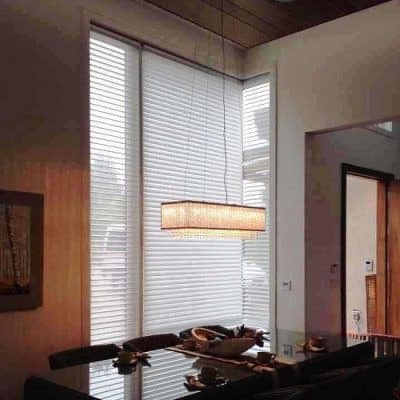 Sheer shades – Sunrise Window Fashions Ltd.
Sheer Horizontal Shades are beautifully elegant, light, and airy. The shade has floating vanes that are suspended between two graceful sheer fabrics – a combination that provides you with absolute control over privacy and light. The sheer smoothly rotate, permitting a veiled view of the outdoors and a soft flow of light indoors. When rotated fully, She Shades become completely opaque creating total privacy and security. Sheer Shades can be ordered in 2”, 2½”, or 3” vane widths in both light-filtering and room-darkening fabrics. Sheer Horizontal Shades are also available with our DoorStyles option. Sheer DoorStyles secures the fabric in a stationary position with tilt-only capability. There is no cassette box on top or hanging cords and is a perfect way to dress up side lights, transoms, or French Doors.